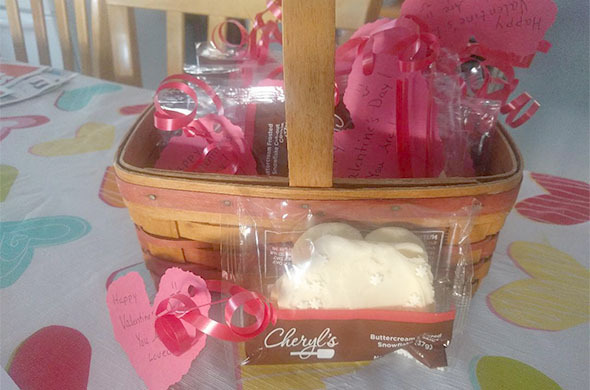 When she got to her first stop—a grocery store pickup for a local food pantry, it was a good thing she had cookies instead of roses, because a bunch of men were dropping off food. Brenda started handing out cookies, and one middle aged man glanced at the tag on the package and then stated that God is no longer around. “I asked him why he felt that way, and he said he felt like God couldn’t be seen in the world around us.” A few others jumped in with comments and suddenly there was a great discussion. The next person in Brenda’s path was a crossing guard. The next stop was Taco Bell where every employee got a Valentine’s treat. After Brenda left the counter with her order, she gave cookies to an elderly couple sitting at a table, and they invited her to join them. Soon they were sharing their story, starting with having been born in Turkey. They couldn’t believe that she was giving away Valentine treats—free! Brenda’s final stop was at Aldi to pick up groceries for her family. There, an elderly man hadn’t gotten a Valentine since his wife had passed away, and Brenda got a little hug and dance!